This is a great park! Everything is very clean and the landscaping is beautiful. Highly recommend. 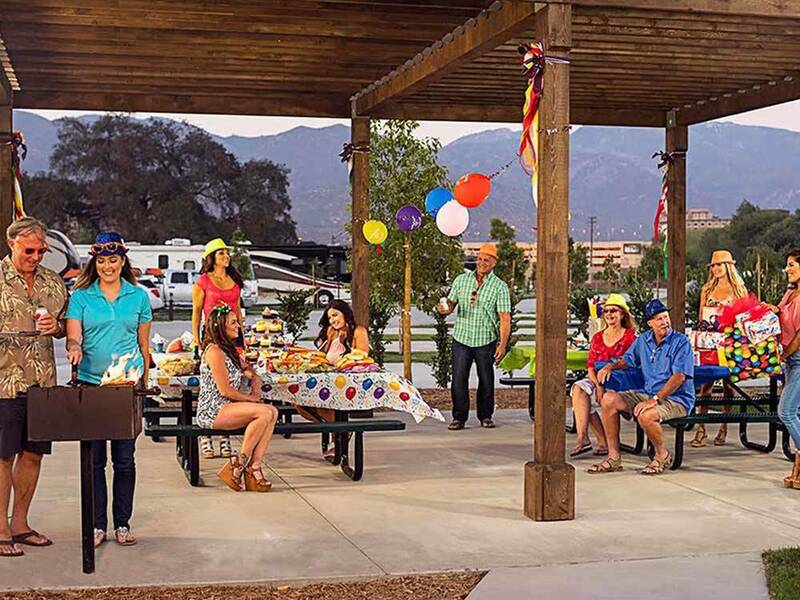 Our camping club stayed the last two years and the facilities, staff 5 stars in our book .Shuttle to and from casino /restaurants pictures on there website are just as you see. This is a really nicely done park. The spaces are huge, level, paved, and nicely appointed. There is plenty of grass and landscaping. The picnic tables are very nice. The WiFi was very good and the cable tv selection totaled nearly 50 channels. The Palomar Mountains surround the park lending to a very nice view in every direction. The swimming pool and two hot tubs are super clean. There are ping pong tables and a pool table in the pool area. The casino is a short walk away and a free shuttle to and from is also available. A mini mart is nearby if you forget anything. The part is about a twenty minute ride to Old Town. We used Lyft and paid 17 bucks each way. The tour companies will pick you up at the Hotel if you want to visit wine country. Overall, a great park and well worth the 40 bucks a night fee. Nice park but our dogs got fleas during our stay. The 6 mile two lane road to get here is very narrow and dangerous. There are a lot of flys, cattle yards are near by. Like this place, it will be nicer years from now when all the newly planted trees grow. Has a shuttle to the casino, but isn't a far walk. It's like you're in the middle of nowhere, but not. It's clean, quiet, and pretty. This was our first time using our travel trailer and our first time in an RV Park, and I know we were spoiled! We had a really great experience and will definitely be back. The park and all facilities are top-notch, clean, and the staff is extremely friendly. The bathrooms were beautiful and had nice showers, the pool was in great condition, and the laundry facility was small but nice as well. We had beautiful views of the mountains and it was very close to Temecula and Escondido. The concrete pads were very nice, as well as the grass area with picnic table and grill and full 50amp hookups. We also visited the Casino (which they provide a free shuttle to/from but it's walking distance) and it was huge and had 10 restaurants and a spa! This was a nice addition to our stay. I noticed that they put on fun events, such as scavenger hunts and tiki parties, to keep customers engaged. I think this is a real nice touch. Definitely a great experience and we will be back next time we travel to Temecula! 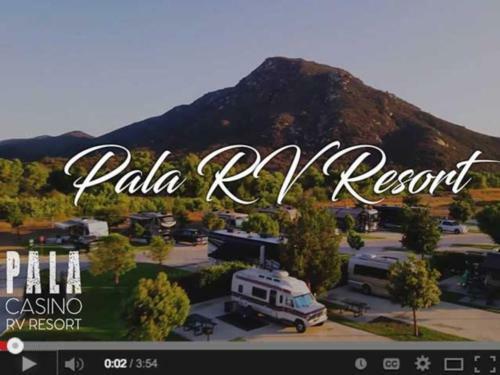 New RV Resort just over 1 year old. Convenient to Oceanside, Temecula, San Diego. Walking distance to Pala Casino and driving close to several other Casinos. Park sites are large with easy to connect facilities, picnic tables, patio. Several young trees planted, will provide shade in a few years. Mountains on three sides. This is located in a hot area of California so AC is really needed in the summer. Staff is friendly and helpful. Only negative was late night noisy and security patrol failed to correct situation. Plenty of avocado and orange orchards in the area. Vineyards galore in the area and a few breweries. Not a kid centered facility, more for adults. The park is new, so everything is fresh and clean. The spaces are large and have a patch of grass and a picnic table. A shuttle runs from the RV park to the casino if you want to gamble or have dinner there. The staff is friendly and well-trained. There is a ranch next door and some of the spaces overlook the horses, goats and the bison. No smell, but lots of animals. Really, I'm tempted to tell people to stay away and keep this place our little secret.